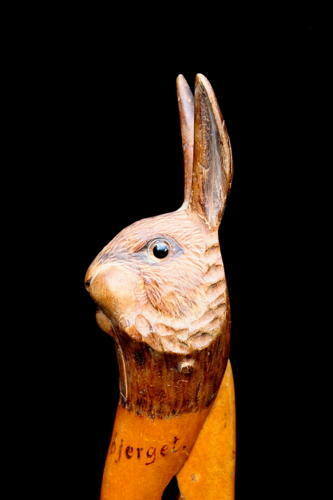 A carved wooden Lever mechanism Nutcracker in the form of a Hare / rabbit c.1900 marked "Himmelbjerget" around the front lever, originally a souvenir. Himmelbjerget is a hill located between Ry and Silkeborg, Denmark in the area known as Søhøjlandet. With a height of 147 m, Himmelbjerget is one of the highest natural points in the Danish landscape.